If you enjoyed the Tube mic shootout for voiceover we posted a few weeks back, you’ll be happy to know that the powerhouse team of Mark Keller and Mathew Trogner sent a second beautiful HD movie of the same three tube mics being used on Keller’s acoustic guitar. As before, we have the original audio WAVs too; just scroll down. The MXL Revelation is a multipattern mic with MXL’s K67-style capsule and a Russian-made EF86 pentode tube. It has a higher noise floor than does the Gemini II, but probably less self-noise than a vintage U47. Hear more samples in our MXL Revelation review. The Neumann U 47 needs no introduction, but for the sake of comparison we’ll state that it was a tube-and-transformer mic with a unique combination of components — capsule, transformer, tube, circuit design, grille — that give the mic a sound that has never been truly replicated. The mic pre was Loudville’s Millennia Media HV-3R. The converter was a Digi 192. The tracks presented below are “dry” — no outboard gear, no plug-ins. As with the VO test, I’ll withhold my comments to give you an opportunity to listen with unbiased ears. What do you hear? Listen for transient response, noise floor, depth, detail, warmth, pick definition, body resonance, and emotional content. Yes, it’s all in there! 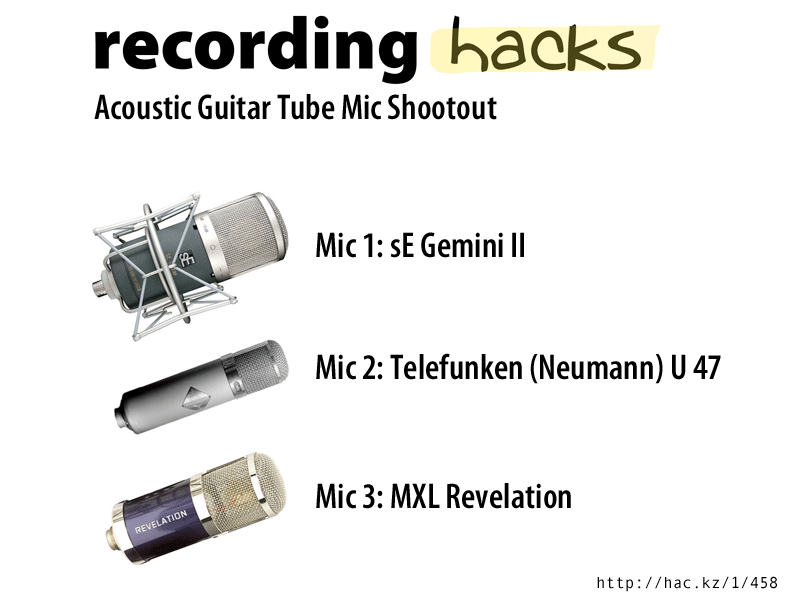 To find out which mic recorded each clip, click here. Special thanks to audio engineer Mathew Trogner, Mark Keller, and the gang at Loudville Studios for making this happen! Thanks also to MXL and Fingerprint Audio for providing the Revelation and Gemini II. Now, slip on your headphones! What do you hear? Which do you like? Great playing. Kudos to Mark Keller. I can’t say I liked any of them. The u47 was certainly usable, but seems a bit too heavy and lacked some articulation, as expected. To me, the MXL sounds flat and brittle. The Gemini II was interesting — with a “woody” quality that surprised me — but it just had too much honk for me. I feel myself reaching for EQ with each of these mics, which to me means I don’t have the right mic yet. For whatever reason, I seem to be very picky about acoustic guitar sounds though, so don’t let me rain on anyone else’s parade. Thanks for a well made comparison with video. Nicely done. 1. Where is the top end? The spectrum that’s there sounds nice, but my brain immediately said something is wrong, because there’s no sparkle, no string squeak. 2. Much better. Sounds real. 3. Ugly bottom-mid bump. Not as nice as 2. My opinion might change radically if the mic was moved an inch in any direction, so I can’t make any guess about the overall quality and utility of the mics, but I would choose 2 for this specific track. (After looking at the IDs) Drat. I liked the expensive one best. I have no experience miking acoustic guitars, but I know what I like, so I put on the AKG’s and listened to the samples without trying to figure out with brand I was hearing. For what it’s worth here’s my review. Sample 1: Nice clean open quality with just enough string pluck to sound authentic. This would be my preferred choice. Sweet. I could listen to this all day. Sample 2: More bottom than Sample 1, a nice full sound on the chords but on certain notes on the edge of boomy. Some notes spike. Not really annoying. A little EQ would fix that. This one sounded better on the JBL near fields vs. headphones. Sample 3: Like #2 this one has a more pronounced low end, but this one gets a little muddy in the headphones for my taste. The near fields were kinder, but the low end still seemed cloudy. Clean high end, though. It didn’t seem to be the right mic in this case, but I’d like to try it with a mandolin. Dwight, the lack of signal-path info was an oversight on my part. I’ve now added it to the main article. It was a Millennia HV-3R, straight into Pro Tools, then output dry. After I posted this comment I went back and reread your revised post. This revised comment reflects that. Thanks Matthew. 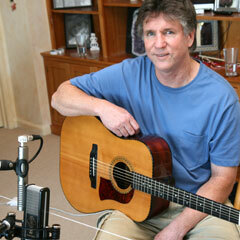 I use my HV-3 when I want a tight fast response – say close mic’d grand piano – so whatever I’m hearing can’t be the preamp! I wonder if it’s something in the encoding/playback path that I’m not accustomed to factoring in. After I posted, I saw that there was a video that showed mic position and guitar … looks like a Martin D-35 and the mic looks like it is pointing at the base of the neck without taking in much of the sound hole. Since there is heavy structural material at the neck’s base I guess this could account for some of the tightness. I should have added that I really enjoy your posts! Thanks for the mic comparison done, now, over a year ago. Overall, I liked the way the SE mic sounded with the acoustic guitar. ( take 1) . The MXL mic (take 3) seemed overly dark( perhaps a little muddy as someone else has said. The Neumann on take 2 seemed on my playback to lack the presence of the SE. Although the performance on the Neumann’s take did not include as much of those nice droning base notes that sounded so good(nice old Martin guitar?) on the SE’s take. The Neumann might deserve another shot at it.Overall, though, the SE picked up a balanced tone from this guitar with a slight bias to the bass which is the natural sound of this instrument. Well done, Matt !P.S. After another listen, the Neumann does indeed have the subtle detail. Can you explain why the U47 sounds tin on the video and sounds large on the mp3 sample like it was full processed? That sounds like this track has been passed on EQ and compressed to me. Sorry but I really don’t buy this. The Gemini II wins all the way on the video but fail on the audio samples. If it is a compression or EQ thing that means somewhere the mic choice between those 3 and even more mics has no real impact on the final product. @strange, best guess is that youtube’s lousy audio codecs are to blame. They definitely bandpass and compress the audio stream. Try watching in HD; that employs a higher-quality audio codec. I had a similar reaction to some of the comments above – and was surprised at how leaden all three samples sounded in their original wav format compared to the mp3 group. In the mp3 group, I much preferred the u47 (and after that, the MXL). I heard the kind of elegant detail that a good vintage Neumann produces (I have a U67). But in the original wavs you posted, something ‘heavy’ is bludgeoning the sound, and my first reaction was something in the signal path is not up to scratch. I record acoustic guitar with a Schoeps641 on the body and an EarthworksTC40 on the neck, and the two mics’ small footprint with pristine clarity seems exactly what the doctor ordered for the instrument. The U67 would give far more detail – but would include the detail of the room reflections, heaps of resonance from the guitar body, etc, which would cancel any advantages. (Schoeps and DPAs are the standard for recording orchestral sections for this same reason). 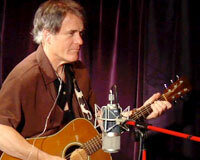 In sum, maybe acoustic guitar is not the best instrument to test a U47 on unless you a) have a real fine signal line, b) you get the placement exactly right (one centimeter either way, plus the mic angle, can make a huge difference to the amount of boom you’ll pick up, and c) you use some shelving. It’s great that you are doing these shootouts, but with mics of this caliber, there’s a lot of devil in the details.